I went to through French Immersion at both elementary and secondary school levels in Brandon. My high school experience was musically rich; I had music classes first thing every morning, choir at lunchtime, a rock band class in last period, with extra-curricular choirs, school play rehearsals and the occasional community band practice or random gig in the evenings. That was my school experience until I came to BU as a music major three years ago, as a bass player. I have been so overwhelmingly fortunate to have received the President’s Scholarship for the Brandon Jazz Festival, the Westman Communications Group/880 CKLQ/94.7 Star FM Scholarship in Music, the J.W. “Bill” Cowan String Bursary, as well as support from Elizabeth May Markle, Press Radio, the Cham Paine Trio, and the University itself, without which I would not be able to be the developing musician and well-educated young lady I am today. Without these scholarships I wouldn’t have been able to spend my summers touring across this giant land-mass we call Canada, from St. John’s to Victoria, with other bright, young musicians. Thanks to these scholarships, I am actually able to spend my time away from school working in my field, and I think any student could agree that that is a hugely valuable experience. I’m also the proud writer of a weekly opinion column for the Brandon Sun, which is a precious creative position in my community I feel very lucky to have. In the 1970s, my parents moved off their respective family farms, both in the Westman area, to attend BU. My dad was playing pop songs on a piano in a McMaster Hall common area and caught the ear of his future wife. They decided Brandon was a good place to raise a family and bought a bungalow in the east side of town, where, when I’m not living out of a tour van, I have always called home. With church musicians for parents, I grew up with hymn rehearsals in the living room every week. Growing up in my house, CBC radio was always, always on the dial. My parents never insisted I take piano lessons or learn music in any grueling, structured way. Instead each fickle creative interest that crossed my mind was entertained while it lasted. They sent me to two or three fiddle lessons at my whim, clay classes at the Art Gallery downtown, accompanied me on weekly trips to the library (I was a voracious young reader), enrolled me in ballet and Hip-hop dance and musical theatre classes, and built a dry-erase easel for my siblings and me. All of these activities boiled down to a natural, inherited place in the creative world. The pursuit of greatness is, as far as I can tell, an ego-driven endeavor that can only satisfy so long as you can fool yourself into thinking that you’re going somewhere. You’re not — you’re just living out your laughably short moment of existence, along with 7 billion other talking water balloons on legs, all hurtling through the universe on a tiny rock in a tiny bubble (which we are lucky to have!) Pursue happiness instead. Take what talents you have and satisfy your innate truths and desires; more importantly, help the people around you live as happily as possible. Realize that the sum total of humanity will amount to nothing, really — a bunch of immortal plastic bags floating around in the Pacific ocean at most — and the best possible outcome of your beautiful little life will be the fact that you comforted, connected, loved and lived happily in this blip of a moment we call a lifetime. I hope to be alive in the future if at all possible, playing music and writing things down for a while. Traveling across Canada has made me curious to see how the rest of the world lives, and I hope to have my eyes opened to other cultures in other places. I see myself learning more than I ever thought I needed to know, be it in school or elsewhere. I hope I get to have fun! Natalie is in the second year of her undergraduate program (she is a jazz performance major in the School of Music). 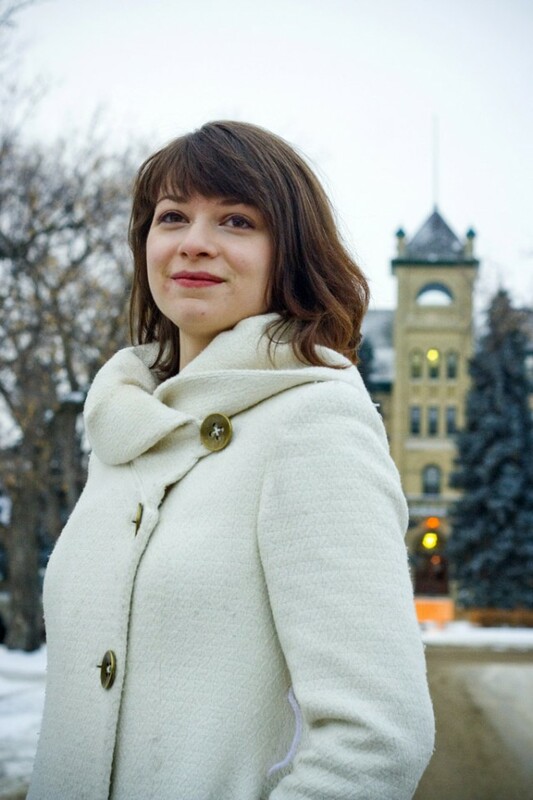 A brief outline of her accomplishments to date would include receiving the President’s Brandon Jazz Festival Scholarship, auditioning into the bass chair of the Brandon Jazz Ensemble as a first and second year student, touring last summer, and continuing to serve as a columnist for the Brandon Sun newspaper. Natalie is an outstanding contributor, playing on many student recitals and freelancing in Western Manitoba. She also performs with the Brandon University orchestra, and maintains a high grade point average.